Signed as a free agent on September 4, 2014. 2015: Posted career highs in games played/starts (15), receptions (69), receiving yards (1,030), receiving touchdowns (6), rushing yards (132) and all purpose yards (1,399) … Eclipsed 100 receiving yards in a game three times, including Aug. 21 at EDM (6-118), Sep. 7 vs. TOR (5-110) and Oct. 9 vs. SSK (4-163) … Notched a career-high eight receptions twice, including Oct. 18 at MTL (8-90) and Nov. 1 vs. OTT (8-55) … Was named a Shaw CFL Top Performer of the Week twice: Week 9 at EDM (6-118-2) and Week 11 vs. TOR (5-110-2) … Played in the East Semi-Final vs. TOR and had one reception for nine yards before leaving the game due to injury. 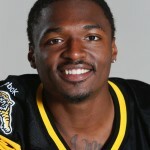 2014: Signed as a free agent by the Toronto Argonauts on March 16…played five games, starting three, for the Argonauts before being released on August 26 … signed by the Tiger-Cats on September 4 … played seven games, starting in one, with the Tiger-Cats … had a total of17 receptions for 210 yards and one touchdown, while adding 11 carries for 113 rushing yards … returned 24 kickoffs for 560 yards and 18 punts for 254 yards in 2014 … made CFL debut at Ottawa on July 18. 2013: Signed as a free agent by the NFL’s Miami Dolphins on May 3 … released by the team on May 28 … signed as a free agent by the NFL’s Green Bay Packers on June 11 … released by the team on July 18 … signed as a free agent by the NFL’s Baltimore Ravens on August 3 … released by the team on August 18 … signed as a free agent by the NFL’s New York Giants on August 21 … released by the team on August 25. Played 36 games in four seasons (2009-12) at Northern Iowa … caught 76 passes for 1,097 yards and 10 touchdowns with the Panthers … had 43 receptions for 499 yards and four touchdowns as a senior … posted an unofficial 4.19 second 40-yard dash time at the University of Minnesota Pro Day in 2013. Born on December 10, 1990 to Terrell Sinkfield and Kim Alston … attended Hopkins High School in Minnetonka, Minnesota … majored in exercise science at UNI.